A genuine and fruitful solution to the conversion of MSG file to NSF file format is the primary aspect of this utility. Along with that, You will get the option to explore many more features of the software application. Every data file is associated with set of meta data giving its source information and other essential details. Similarly, MSG file is also comprised of meta properties. All the basic meta properties of MSG file remains intact without any data loss. There is option available to add folder containing multiple MSG files for conversion in NSF file format. So, there is no need to add various .msg files one by one i.e. very time taking. The folder hierarchy of any email data file is very important part. Since, it is quite impossible to rearrange the folder hierarchy after getting disturbed. This tool enriches you with the preservation of original folder structure. If you are in need of converting some particular data of the MSG file. Then, You can apply date filters to get the data of a selective date range. You just need to enter the date range you want data for. MSG to NSF Converter is compatible with all the versions of Lotus Notes email client including Lotus Notes 9.0.1, 8.5 and below versions. The software is efficiently runnable on Windows 10 and below versions. So, You are not bound to only a particular or few Windows versions. A MSG file is a contact, email message, appointment or task saved or created in Windows Outlook. It can be incorporated with one or more email fields including date, recipient, sender, subject, contact or appointment information. This file format is also compatible with other email programs using MAPI (Messaging Applications Programming Interface). With MSG to NSF Converter, You can easily import Outlook .msg files to Lotus Notes. Hence, It is not difficult any more to move among different email programs with such great utilities. Step 1: Install the software after downloading. 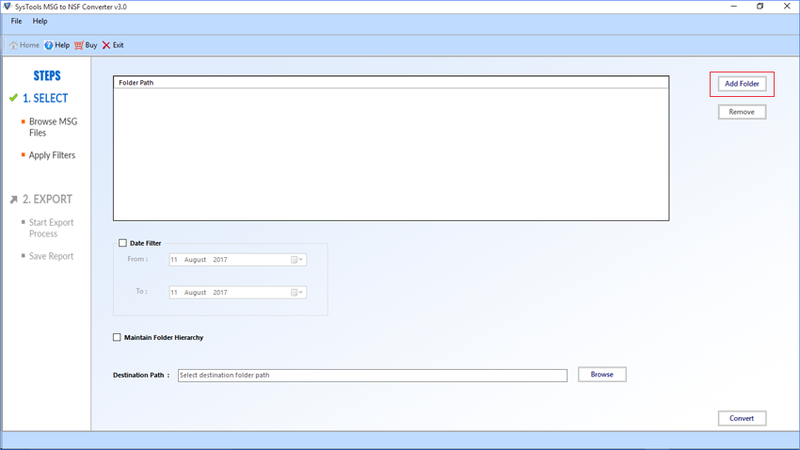 Start the tool from Start >> All program >> MSG to NSF Converter.Then, Check for all prerequisites. Step 2: You can add folder containing multiple input files. 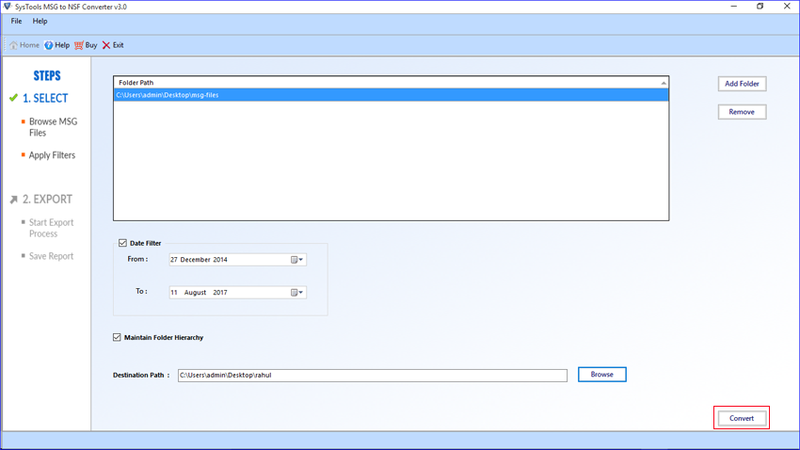 Step 3: Set a date range with the "Date Filter" option. Step 4: Choose a destination to save the output file. Step 5: Click on "Convert" to initiate the process. Step 6: You will get notification after completion of the process. What is the limitation on quantity and size of MSG file? You can convert multiple MSG files of any size for converting into NSF file format. What will be the location of NSF file after conversion? You can save the NSF file at desired location on your system. Should I run the software on Mac Machine? It is not possible to run the software on Mac machine. The tool is developed only for Windows. I was stuck with a bunch of MSG files. I wanted to access those files in Lotus Notes, not able to find a way to move into Lotus Notes. QuickData MSG to NSF Converter did a great work for me after converting all the MSG files to NSF format. I am not much familiar with the technologies and software applications. 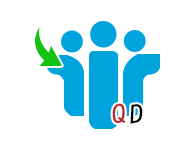 QuickData provides a great support with their effective and cooperative support team. Thanks a lot for each and every service offered by you people.